The Norton Simon Museum in Pasadena is one of my favorite art museums in Southern California because it packs such a concentration of well-known art into a manageable space. The Getty Center and LA County Museum of Art are great museums with plenty of masterpieces, but for art value per step, you can't beat the Norton Simon. Originally based on the private art collection of industrialist Norton Simon, the museum took over the Pasadena Art Museum in 1974 and the collection has continued to expand. The museum has two levels. The Main or Upper Level houses European and American Art from the 14th to the 20th century. The Lower Level is home to an extensive Asian Art Collection with South and South Asian sculptures, antiquities and architectural features. The temporary exhibit galleries are also downstairs. There are three sculpture gardens, two accessible from the Main Level, one from the Lower Level. On the Main Level, there is a 300 seat theater. If you have time, any of the four orientation films shown throughout the day will give you additional insight into the collection. One is a 30 minute documentary about Norton Simon and his passion for art, the other three are 20 minute segments from the PBS special Sister Wendy at the Norton Simon Museum. The galleries on the main level are all in a row, so you can walk up one side of each wing and down the other and see everything. The exhibits are chronological though, so if you want to compare art from the same time period, you'll need to view each room before moving on to the next. If you start chronologically, one of the earlier works to look for is Raphael's famous Madonna and Child with Book (c.1502-3). Francisco de Zurburan's Still Life with Lemons, Oranges and a Rose (1633) is one of the most studied pieces in the collection along with Rembrandt van Rijn's Portrait of a Boy, Presumed to Be the Artist's Son, Titus (c. 1645-50). The Impressionists collection is the most popular part of the museum and it's easy to understand why. Within a few steps, you can see paintings by Matisse, Renoir, Van Gogh, Manet, Monet, Toulouse-Lautrec, Cezanne and Degas, with multiple examples of each. 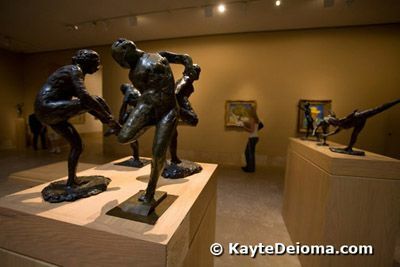 The museum has over 100 works by Edgar Degas, including drawings, paintings, sculptures and the bronze modèles he used as studies for his larger sculptures. Pablo Picasso was another of the collector's favorites. The museum owns 45 Picasos from early pre-cubist drawings to bronze sculptures and the well-known cubist icon, Woman with a Book. About a dozen pieces by the artist are on display at any one time. Many people I know have visited the Norton Simon a number of times and never been downstairs. Even if you only have a few minutes, I would highly recommend a stroll through the Asian Art Collection. Works from India dominate, but Tibet, Nepal, Cambodia, Thailand and other South and Southeast Asian countries are also represented. There are plenty of the typical statues of Buddha, Vishnu and Ganesh, but also excellent representations of the playfulness and eroticism found in South Asian art. The temporary exhibit galleries are also downstairs, featuring rotating exhibits from the permanent collection. The Norton Simon Museum has a popular Sculpture Garden and Café at the back of the museum. A collection of large sculptures, mostly by French artist, Aristide Maillol, surround a small pond. The café is run by the Patina Group, which also has restaurants at the Music Center and Disney Concert Hall in downtown LA, so at least you can get a decent chicken sandwich. There is also a small lesser-known Asian Sculpture Garden accessed from the Lower Level. However, I find the most notable outdoor art to be the Rodin collection in front of the museum entrance. Not only does the Norton Simon have one of the 12 copies of Auguste Rodin's six-figure Burghers of Calais, but they also have several of Rodin's studies of the individual figures that he created before compiling the six men into one sculpture. The Burghers of Calais was commissioned by the city of Calais to honor the sacrifice of six wealthy citizens who hostaged themselves to the King of England in 1347 to free their town. In the final sculpture, the six men are in ragged clothes with nooses around their necks. Before creating the composite piece, Rodin sculpted each man alone, first unclothed and then clothed. You can see Rodin's development of these individual characters in those studies on display around the front garden. Museum gardens and store close 15 minutes before galleries. Admission: $12 adults, $9 seniors, free for children under 18, students with ID and Active Military with ID. Free to all the first Friday of the month from 5 to 8 pm. This information was accurate at the time of publication, but may change at any time. Please check the museum website for the most current information.